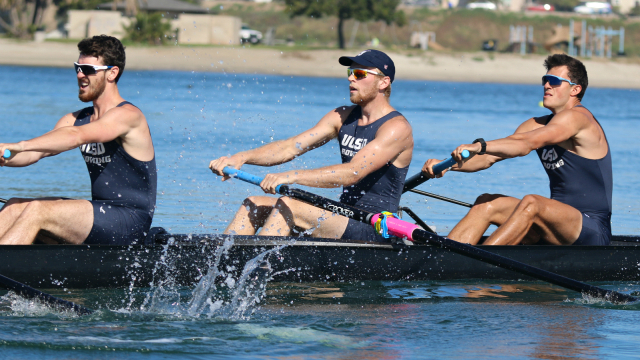 The rowing programs at the three local universities will open their season Saturday with a charity race in Mission Bay. The 17th annual San Diego Row for the Cure is a partnership between UCSD men’s and women’s rowing program and Susan G. Komen San Diego to raise funds and awareness for breast cancer. Joining the Tritons are the San Diego State Aztecs and USD Toreros. While the regatta is the unofficial season opener for the three programs, the race is open any human-powered watercraft. In the past, this has included rowers, kayakers, stand-up and sit-down paddlers, first-time rowers in the barge and outriggers. Local rowing clubs, such as the San Diego Rowing Club and ZLAC Rowing Club, are also participating in the regatta. Seventy-five percent of the funds raised at the event stays in San Diego to provide support for uninsured and underinsured breast cancer patients and the rest goes to Komen for the Cure national breast cancer research. The event raises funds through registration fees, donations and raffles. Last year’s event raised $26,000, a record. Registration and check-in begin at 5:30 a.m. at North Ski Beach on Mission Bay and races are scheduled to start at 7:40 a.m.